550 square foot lab/culture spaces adjacent to the Flowing Seawater Laboratory. Furthermore, office spaces and a 700 square foot dry laboratory are available in the Marine Culture Laboratory which also houses the SeaCaps® algal culture facility. Industry partners may want to use a few tanks for a few days or weeks to carry out specific trials or a whole building for multi-year projects. American Unagi is a startup American eel growout enterprise developing culture technology for rearing wild-caught glass eels to market size to meet the growing US demand for eels. Maine Shellfish Developers, LLC is developing land-based nursery systems for culture of Eastern oysters. 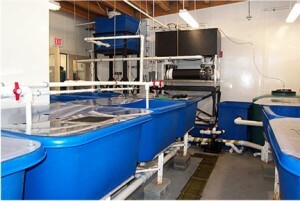 AquaLine, LLC is developing novel culture systems to support the aquaculture industry.